Drought conditions can create challenges for both people and animals, and Mexico has experienced its own share of issues as the southwest region of the United States has faced drought in recent years. 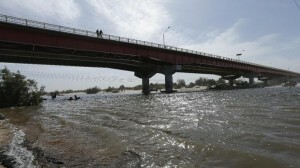 Plans to release water at the U.S.-Mexico border into the normally dry bed of the Colorado River in Mexico is expected to restore wetlands along the shore. The water to be released will come from Lake Mead and has been banked as part of Mexico’s allotment. The release will represent less than 1 percent of the yearly flow of the river, but reactions should be interesting as residents in the area experience a renewed presence of flowing water. Mexico insurance from MexicanInsuranceStore.com is important if you plan to view this for yourself. You can find your Mexico auto insurance policy online on a 24/7 basis. Mexico insurance from MexicanInsuranceStore.com is now a legal requirement in order to drive in highways in Mexico. Each Mexico auto insurance policy includes legal assistance and if you choose Full coverage you can repair in 3 countries. Fresh water flowing can be exciting for locals along the area. In 2004, heavy winter rains restored the flow of water to arroyos in Baja Norte that had been dry for many years. Local women cheerfully took laundry to the area to do wash. Groups of locals flocked to the area for swimming, picnics and even baptism ceremonies. While the arroyos may only have experienced temporary water flow, the excitement was tremendous in the community. As you travel in Mexico, the availability of fresh drinking water may be a concern. However, you will find that bottled water is easily accessible at both large and small markets. Additionally, you can carry 5-gallon jugs to fill at local grocery stores or water supply shops. Although delivery trucks often travel through communities to sell water, the exchange of containers may be a good reason to carry your jugs to a facility that conducts thorough cleaning before filling your jugs. Long scrub brushes are used to loosen any algae or foreign material with hot, soapy water. Jugs are rinsed before being refilled, important for ensuring that you aren’t carrying contaminated water back to your RV, rental home or motel. Your Mexico auto insurance policy includes travel assistance features to address problems like trip interruption due to grave illness. Drinking contaminated water is a common way for foreigners to get sick in Mexico, and the severity of symptoms can range. Be safe about your drinking water, but remember that your Mexico insurance from MexicanInsuranceStore.com allows you to get advice and assistance in severe situations that might lead to early trip termination. Mexico insurance from MexicanInsuranceStore.com comes with Roadside Assistance throughout Mexico at NO additional cost. Driving your car in Mexico was quite similar to driving in other countries. The big difference is that Mexico requires the use of Mexican auto insurance.